As Part of our dedication to Rapid Aluminum Tooling with “No Limitations”, Class A Surface Finishes are available in order to create optical components like prisms, light pipes, light guides and clear lenses from materials like Acrylic and Polycarbonate. Even with the highly aesthetic nature of clear plastic parts and the surface quality needed to achieve them, it is not impossible to expect the highest level of quality from Aluminum Tooling. Clear plastic components require tight tolerances and attention to detail other surface levels don’t require. Many “Rapid Prototype” shops don’t have the capabilities to tackle these types of finishes. IPP™ however does allow PHOENIX PROTO the ability to create the very best quality injection molded plastic prototype parts guaranteed in (1) Day to (3) Weeks maximum, with no design limitations. If needed, there are surface treatments that can be applied to “harden” Aluminum Tooling to ease the creation of certain difficult optical designs. 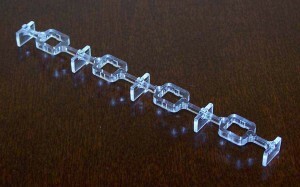 There are several different effects and uses that clear plastic optical prototypes can be designed for. Basing component design on the Total Reflection Principle (T.I.R.) to achieve guided light pipes, prisms, and lenses means unlimited applications of the principle. Using materials with different refractive levels allows a designer to manipulate light using T.I.R. The principle at the most basic equals 2 different levels of refraction meeting at the angle of incidence and the light reflects away. That being said, in optical components refraction and reflection play major roles in the dispersion of light. In people speak think of… Diamonds: the cut determines the direction of the sparkle, the sharper the cut the more sparkle. The Angle of Incidence is where the Diamond meets air. The Angle of Incidence is why the light seems to bounce off the diamond. T.I.R. is also responsible for the phenomenon that occurs when light bounces off water droplets, better known as Rainbows. Easy explanation: the light “shifts” or “bounces” off or through an object. This theory is critical in the engineering of optical components. Certain optical components use different cuts and angles to transport / manipulate the light to the desired location. Without the smooth finish all the careful designing for the proper impact of light is for nothing. This is why Class A Surface finishes are so critical in the manufacturing of an optical component. Imperfections of any kind can alter the direction of the light, ruining the design that was created solely to optimize the desired level of light manipulation. Aluminum Tooling can easily achieve the Class A surface finish required to create optical components. 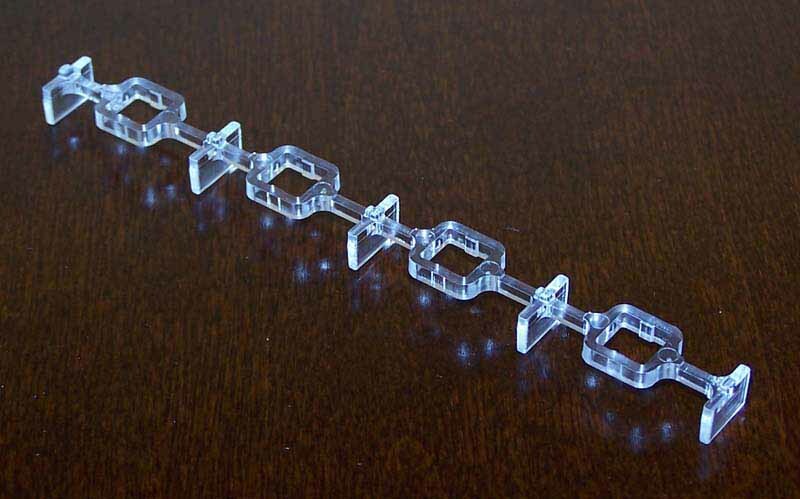 Light pipes / light guides both equal light being “piped” or “guided” down the clear plastic from one end to the other. Acrylics and Polycarbonates are used due to high clarity properties; which reduces attenuation of the light. Attenuation means the gradual loss of intensity of light, or strength of a signal. The plastic “pipe” is designed in such a way that the light guided through it reflects back upon itself throughout the whole of the part. This inward reflection keeps the light “bouncing” back upon itself moving evenly towards the intended area of the design. The use of Light pipes / light guides has reduced the overall cost of manufacturing any type of component that requires back lighting. Most often Light pipes / light guides are used to light the instrument panel in an automobile. A display on a medical device or to show various indicator lights on an electrical component. The range of possible applications in injection molded plastic devices is limitless. Another important property of light pipes and light guides is the lack of heat found in other lighting devices. This can be critical in a tight space with low air flow, or in a heat sensitive area such as a patient whose doctor is using a medical device upon them. Previous to Light pipes / light guides, LED lighting was exclusively used. This was a rather resource intensive task as each light had to be placed behind the object being back lit. Today the use of Light pipes and light guides is not only cost effective but practical because the lighting is more consistent through out the device that needs lighting; and can be used to light up several devices per Light pipe / light guide. Only a few LED’s need to be used and the Light pipe / light guide can efficiently direct the light to the correct device without any loss of intensity. A prism is based primarily upon the dispersion of light. T.I.R plays a part in this dispersion of light in a prism creating a sparkle of light. Clear plastic refracts light differently than glass; it separates the colors of the spectrum clearer. Because of the multi-faceted nature of plastics like Acrylic and Polycarbonate (much like a diamond) the reflective qualities make clear plastics use a natural choice in prism lighting design. Most plastic prism’s are used in applications that require concentrated and focused light. A Fresnel Lens is a type of prism. Flat on one side and ridged on the other. Fresnel Lens are constructed of multiple concentric circles to enhance light and image quality rather than focus light like other optical components. Still reading? Don’t let me lose you as we continue. You might remember seeing a Fresnel lens way back when. Fresnel lens were most often used as a portable device to help sharpen the TV screen… Grandma’s big screen Television and the grand kids were the remote control. As old fashioned as that giant magnifying glass on wheels was… the same technology is being used on giant screen TV’s today. They just look nicer and the grand kids don’t have to keep clicking the channel knob till Grandma finds her favorite programs. Almost all automobile lens… tail lights, head lights, etc are made as a plastic Fresnel Lens made of Polycarbonate or Acrylic due to the durability and strength of both types of plastic. The science behind Fresnel types of lenses are showing up in medical imaging innovations where high resolution, optical quality, light weight, lack of heat and cost efficient production is desirable. In medical applications as well as consumer optical grade Acrylics and Polycarbonates are used. These types of lens are also being used for over head projectors, projection TV’s, and a multitude of other applications where low cost, low weight and optical clarity are needed. Clear plastic lenses are often used in construction products such as laser pointers, construction levels, and surveying devices. Protection devices like face shields and safety glasses also use clear lenses when the safety and strength of the plastic is important to the users safety. Clear Plastic Lenses range in applications from consumer goods like sunglasses, various lighting applications from flood lights to flash lights. Polycarbonate is generally used as an optical lens due to it’s strength yet flexibility, especially in products for safety or that need to stand up to hard daily usage. Its strength is why it’s often used for safety applications and bullet proof windows. Polycarbonate’s flexibility makes it a natural choice for sunglasses and eyeglasses because Polycarbonate will bend farther than any other plastic of the same thickness. Polycarbonate has a unique blend of flexibility while maintaining strength and optical clarity that no other plastic can match. There is a difficulty level in working with translucent plastic resins. Both Acrylic resin and Clear Polycarbonate have high melt points. And equally both Acrylic and Polycarbonate resins have their own specialized process which can get tricky if not handled by a seasoned professional. Add the intricacies, attention to detail involved with Aluminum Tooling in order to get production quality parts from non-complex designs and common plastic resins. PHOENIX PROTO’S IPP™ method follows Scientific Molding principals that is designed not only for success with normally tricky resins, but also cost savings not normally seen with difficult resins coupled with complex designs. IPP™ is also geared for lean manufacturing for extra cost savings and adheres to our 3 weeks no limitation concept to parts Aluminum Tooling. Acrylics have excellent transparency, optical clarity and hardness that are all desirable qualities in lenses, prisms, and other light guiding optical applications. Acrylic is often used instead of glass due to Acrylic’s ability to refract light and filter the light according to a design based upon Total Reflection Principle and the Angle of Incidence. The Acrylic family of resins are very heat resistant which make it a somewhat difficult plastic to run for desirable applications. Though when run correctly, Acrylic plastic properties are attractive to design engineers due to Acrylic’s very versatile nature and a practical choice for decorative plastic manufacturing. Clear Polycarbonate is preferred due to high optical transparency that allows for complete light reflection. High optical transparency makes clear Polycarbonate a natural choice for Light pipes, light guides and optical lenses. The impact resistance and heat resistance qualities make Polycarbonate especially favorable to consumer and medical applications. Adding that there are medical grade ISO 10993-1 and USP Class VI standard Polycarbonate make it even more useful to medical applications requiring such plastic types. Prototype molders generally do not favor Clear Polycarbonate due to its high mold temperatures. In order to create desirable parts the temperature has to remain at a constant in order to flow properly and overcome it’s inherent nature. Which in rapid injection molding is a level of difficulty that often cannot be turned into an efficient enough process for quick turn around parts. PHOENIX PROTO IPP™ method is uniquely suited for creating optical components, quickly, efficiently, and correctly.